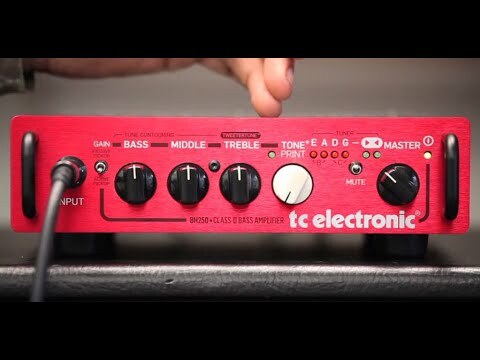 TC Electronic's new BH250 is the only bass head that offers virtually endless musical and tonal inspiration via the revolutionary TonePrint concept in a package small enough to fit in your gig bag pocket. With this compact, low-end wonder you get a massive 250 watts of power and a tone to die for, but it also adds ultimate versatility via the unique TonePrint feature and a built-in bass tuner that works on anything from 4 to 6 strings. The TonePrint concept allows you to load signature bass effects in seconds: Chorus, Flanger, Vibrato, Sub'n' Up Octaver, SpectraComp or Bass Drive. You can choose from an ever-expanding list of signature artist TonePrints created by bass masters like Nathan East (Eric Clapton, Fourplay, Toto), Charles Cave (White Lies), Michael Shuman (Queens of the Stoneage), Gail Ann Dorsey (Lenny Kravitz, David Bowie, Seal), Mark King (Level 42), Roscoe Beck (Leonard Cohen, Robben Ford) and many more, all available for free on TC Electronic's website or via their TonePrint App for iPhone and Android. No doubt, playing with bass effects is loads of fun and can be an everlasting source of inspiration, triggering totally different ideas for new grooves and bass lines. The BH250 is so compact that it will fit in the pocket of your gig bag, and at just 4 lbs., the weight is hardly going to be noticeable. Whether you need a bass head at a rehearsal spaces, at home for practicing, for gigging at small to medium-sized venues or all of the above, BH250 is the perfect, portable solution. You can hook up BH250 to any cabinet, or combination of cabinets (min. 4 ohm load). TC Electronic recommends using BH250 with their range of BC cabinets or top range of bass cabinets - the RS series. TonePrint is a flexible effect slot that lets you decide exactly which effect the amp should use at any given time. BH250 comes loaded with our legendary SCF Chorus as default, but you can download numerous new bass effects from our website, replacing the chorus with other effects such as Octaver, Compressor, Overdrive, Distortion, Flanger and Vibrato. To make the deal even sweeter, we had some of the best bass players in the world tailor their own personal effect tones for you to grab, and best of all these Bass TonePrints are completely free of charge. To load new types of effects or the artist-made Bass TonePrints, simply hook up your amp to a computer via the included USB cable. Or even cooler: beam them directly from your smartphone straight into BH250 using the mindblowing TonePrint App for iOS and Android. Quite simply, it is an ever-expanding effects joyride, as new TonePrints will be added constantly in the future. This is merely the beginning. Please note : BH250 and BG250 share the same TonePrints, so you can load any BG250 TonePrint into BH250 - and vice versa.